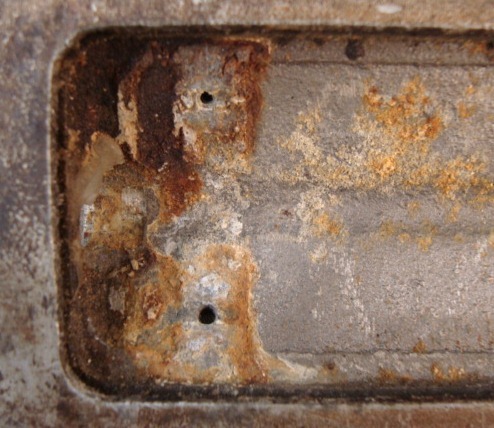 There are a variety of methods to clean oxidized and corroded metal parts. These same methods can also used to strip paint. Often the most effective method is to use abrasive blasting. The selection of blasting media will depend on the aggressiveness required to accomplish the task, the desired cycle time and (sometimes most importantly) the surface finish needed. The aluminum part in the picture above is a component of a restoration project. It was blasted with 120 Mesh Aluminum Oxide Grit to quickly remove the undesirable oxidation and corrosion and leave this surface ready to accept paint. This media was chosen to provide a very short cycle time, to result in a micro-etch on the surface to accept a new coat of paint and to also strip paint of other areas of the project (see below).